Whereas many books look at how women's bodies are represented in different religions and cultures around the world, this work explores the site of a woman's voice and identity, her head. The female head threatens to disrupt the classic gender distinctions that link men to speech, identity, and mind while relegating women to silence, anonymity, and flesh. The contributors to this collection argue that the objectification of women as sexual and reproductive bodies results in their symbolic beheading. Decapitation occurs symbolically in myths as well as in actual practices such as veiling, head covering, and cosmetic highlighting, which by sexualizing a woman's face turns it into an extension of her body. 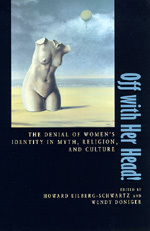 The essays explore how similar treatments of the female head find their unique articulation in diverse religious traditions and cultures: in Hindu myths of beheading, in Buddhist and Tantric practices and poetry about the hair of female nuns, in the resistance to veiling by early Christian women at Corinth, in contemporary veiling practices in a Turkish village, in the eroticization of the female mouth in ancient Judaism, and in Greek and Roman cosmetic practices. Together these essays show how the depiction of the female head is critical for an understanding of gender and its influence on other fundamental religious and cultural issues. Howard Eilberg-Schwartz is Associate Professor and Director of Jewish Studies at San Francisco State University. He is the author of God's Phallus and Other Problems for Men and Monotheism (1994). Wendy Doniger is Mircea Eliade Professor of the History of Religions at the University of Chicago and author of Women, Androgynes, and Other Mythical Beasts (1980).